If you are one who enjoys grilled game, fish or fowl, this aromatic jelly is for you. And if you’re not one to consume any of those, you will still enjoy this with cheese and bagels, or simply on toasted sourdough bread. Either way it is a perfect condiment for any larder. Even knowing that cedar is one of the many flavourful and scented evergreens native to this region, I have hesitated to use it up till now. It contains a chemical called thuja which should not be consumed in large quantities, and definitely should be avoided by pregnant and nursing women. Recently I watched a cooking show about pre-colonial recipes, and noticed they used a cedar jelly as an accompaniment to game, so I figured that the quantities of thuja in this had to be tolerable. On further researching, I discovered that there are several greens which contain this chemical, most notably juniper, some mints and sage, all of which are found in most cooks’ pantries. I also learned that early settlers used the leaves to make tea to prevent scurvy, and many campers continue to use it as an available source for a tasty drink. I therefore concluded that making a cedar jelly recipe to be consumed occasionally in small amounts would be delicious and safe, as long as you are not pregnant or nursing. The cedar tree I am referring to is one that is commonly found in the north eastern parts of North America – the eastern white cedar. There is a similar western version, but I am only familiar with the one from this zone. It is a fast growing, hardy conifer favoured in landscaping but also easy to find in the wild. Its small scaly leaves cover the fan-shaped twigs and vary from yellowish to deep green. Its small cones grow in clumps of five or six pairs. the longer the cooking process, the more flavour will be lost. So bearing these in mind, here is the recipe I came up with. Place the leaves and water in a jar and press the leaves down to submerge. Cover with a lid and set in the sun for at least four hours. This will extract a good amount of flavour without cooking it. Strain the liquid, add the sugar, lemon and pectin. Bring to a boil and simmer for about 10 minutes, until foam forms on the top. Skim off the foam and bottle. To date, I have no way of measuring the ph level for purposes of canning, so I am just freezing as my method of storing. This recipe makes three 8 oz jars. Linked to: Fiesta Friday #184; Food Eat Love; The Not So Creative Cook. Categories: evergreens, infusions, jams and jellies | Tags: cedar jelly, evergreens, Fiesta Friday, foraging, thuja | Permalink. Here is a way to preserve the exquisite colour and scent of your peonies – a flower which graces our gardens for an all too short period in the early summer. Serve it with your favourite buttered scone, as a garnish to fruit salad or just about any other dessert. I have recently been experimenting with floral flavours from my garden as they appear – just the edible ones of which there are more than you would think. The easiest way to use them is often mixing them half and half with sugar, grinding them and allowing them to dry to be used as a sweetener. Jellies, perhaps the most obvious use, are a little more challenging. Pectin and some form or acid are necessary to get the desired consistency are necessary, but working out the ideal proportions and cooking time have proved to be a little challenging, leaving me at times with something either too thin or too thick. Also, not all pectins are made equal, so even when following a recipe the results can be disappointing. For my first effort, I used a combination of white and red flowers – being careful to pick the ones with the best scent. I also used liquid pectin which might have been the reason that I needed a suspiciously large amount (2 packages) and long period of cooking. The result was satisfactory, the colour and flavour were better than I had hoped for, but the recipe was just too complicated and required too much cooking to share. So a second effort was called for. This time I chose them for the colour – mostly red and some pink. I used powdered pectin, Certo pectin crystals to be exact. The cooking time was reduced by about one third and the consistency was perfect. While the white ones did give a beautiful reddish amber colour, the red and pink produced a stunning ruby colour, so if colour matters, go for the red as long as they have a good strong scent. This picture shows the difference of colour, although in photographs the contrast is not so pronounced. Method: Put the petals in a bowl and cover with boiling water. Use a plate on top to press them down and make sure they are all covered in water. Leave to infuse for 6 hours. Strain them through a cloth and ring tightly to get all the liquid out. Discard the petals. Pour this liquid (I had 2 cups) into a pot, add the strained juice of the half lemon, the pectin and 2 cups of sugar. Bring to a boil and simmer for about 20 minutes, until it reaches 215 degrees F or 104 C if you have a thermometer. Otherwise you can put a small spoonful on a chilled dish and and when it cools it should set. Also, it is ready when the bubbling becomes so vigorous it does not subside when you put a spoon in it. There are so many ways to use floral jellies. One of my favourites is to use it to sweeten tea while sometimes with fresh buttered bread or biscuits alongside tea is preferred. It also works well as a garnish. Linked to: Fiesta Friday #124, Love in the Kitchen and Spades, Spatulas and Spoons. Categories: edible flowers, jams and jellies | Tags: Fiesta Friday, jelly, peonies | Permalink. 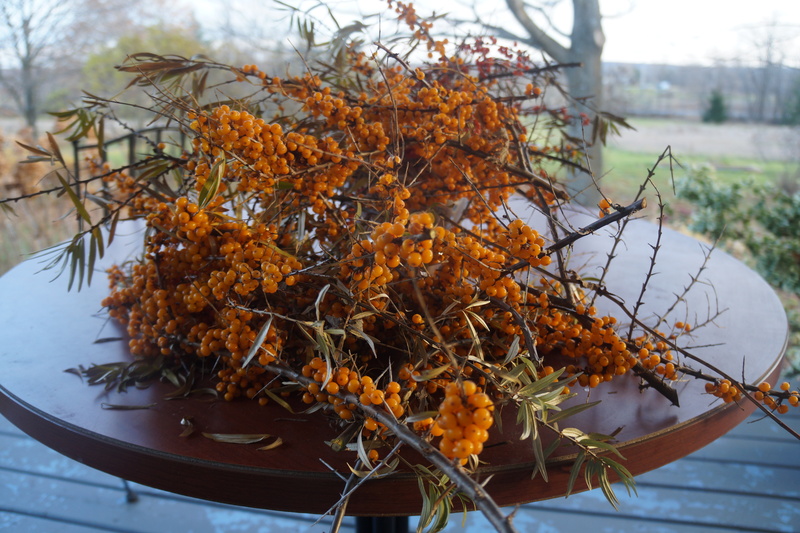 My seabuckthorn plants are flourishing, and the three female plants are producing far more berries than I can pick. They are also reproducing at an almost alarming rate, although the lawn mower has unwittingly taken care of some of the shoots coming from, I believe, the male plant. 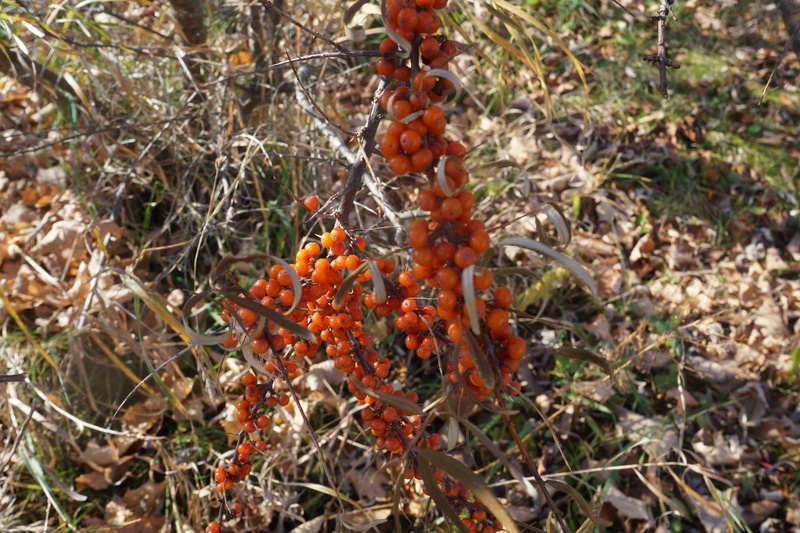 Their rate of growth is encouraging, and I expect some of the seeds will find their way into neighbouring properties, so foraging sea buckthorn in this area might become a reality before long. 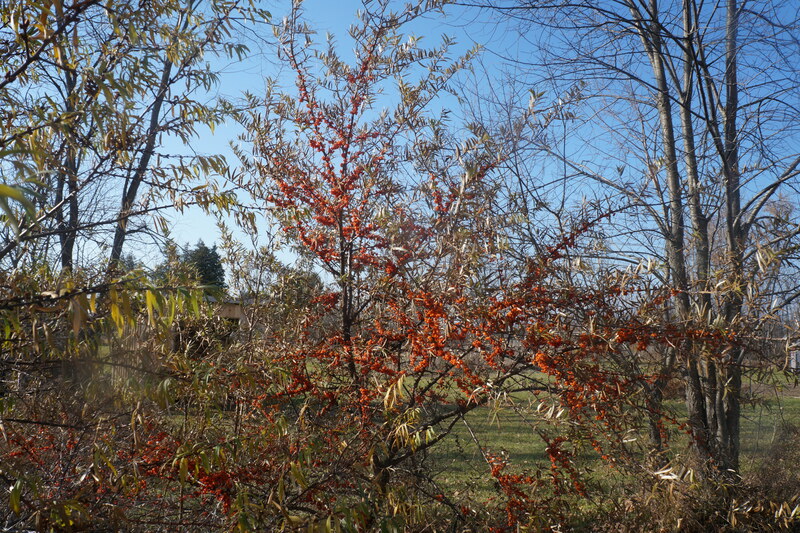 I have written about this remarkable shrub in an earlier post, but since then have learned some practical tips about how to harvest them. They are difficult to pick. They are indeed thorny, and the small berries are soft with a very thin skin, so as soon as you apply a little pressure when picking, they tend to collapse and squirt you with sticky juice. However, if a few branches are snipped off and put in the freezer for a day, they can then be removed from the branches quite easily. As the plants need some good pruning anyway, this is the perfect time to do it. If you find them in a local market, this is the way they will be displayed – thick clusters still on the branches. The delicate leaves can also be removed to make a delicious tisane. As for the berries, I decided to make a jelly which would be an easy way to preserve them, and presumably a useful addition to my pantry. I used only one cup of berries, and did not worry too much if some of the woody bits attached to the base were still attached as it would all be strained after the first cooking. To make the jelly, I covered the berries with water and cooked them until soft – about ten minutes. I strained them, added a little hot water to the pulp and strained them again. For two cups of strained juice, I added three cups of organic sugar. This I brought to a boil and then simmered until it reached a temperature of 235 degrees F or 120 C. If you don’t have a candy thermometer, you will know it is ready when it reaches the soft ball stage. Pour into a jar and let cool. The amount of sugar in this means that it will keep for a few weeks, so I didn’t worry about processing it. I didn’t even remove the foam from the top because it too is just as tasty! The flavour of the sour raw berries is not appreciated by everyone, perhaps because it is so unfamiliar, but once cooked with sugar it has a fruity caramel taste. It makes a wonderful spread, but can also be used in baking, desserts, as a glaze or a sweetener for drinks. In short, anywhere you might use honey. Categories: jams and jellies | Tags: berries, honey substitute, jelly, seabuckthorn, vegan | Permalink. This is the last of my series of three goldenrod recipes. The stuff is still blooming everywhere I look, and it is tempting to keep picking, but I’ll just settle for lots of ‘tea’ to help ward off allergies for the rest of the season. There are just too many other fun things out there to experiment with, and time is running out as the days and mostly nights get markedly colder. 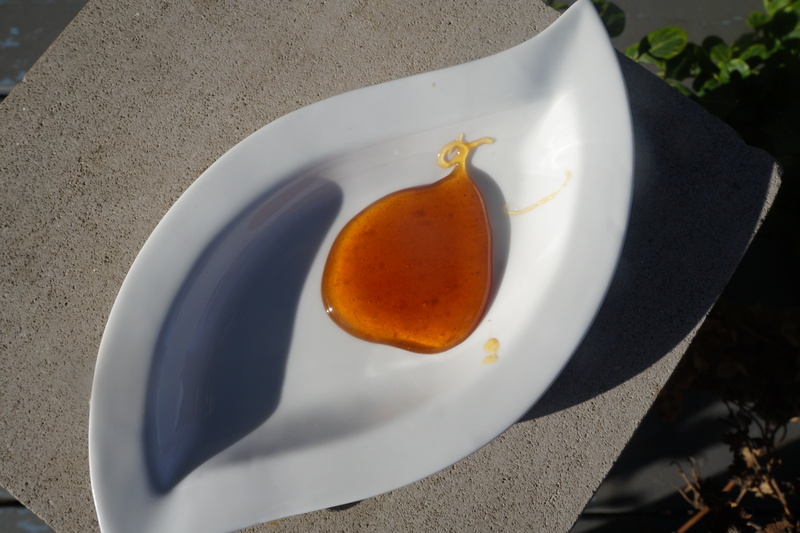 This jelly is very simple really – just apple jelly using goldenrod tea in place of water. Simple as it is, the flavour is distinctively herbal and delicious variation. 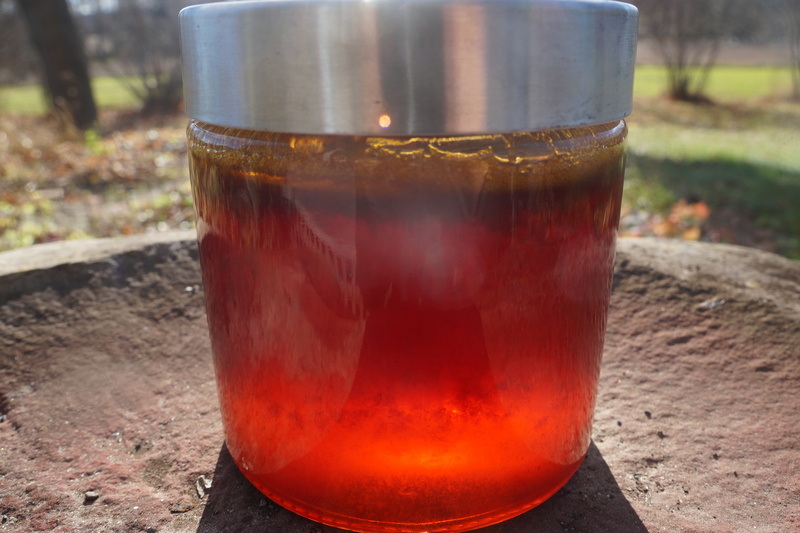 You could follow any apple jelly recipe such as this one and use the goldenrod tea as liquid. For mine, I had three pounds of tart apples picked from a local tree. I covered it with the goldenrod liquid, cooked it until the apples were good and soft. Then I strained it through a jelly bag (or several layers of cheesecloth) overnight and discarded the pulp. For four cups of liquid, I added three of sugar and one-half package of pectin. Because the apples already have pectin, I didn’t need much, but the pectin meant I could get away with using less sugar. I cooked the apple, goldenrod and sugar until it came to a full boil and the sugar was dissolved, added the pectin and cooked a further minute, then bottled. I didn’t use the canning process for it because I’m not sure if there was enough sugar or acid content, so I just froze the extra. I prefer to have a less sweet jelly even if it does mean having to store it in the freezer. I was hoping for a golden colour to match the flavour, but am otherwise happy with this unusual and very seasonal recipe. Here I served it on an English muffin with semi-clotted cream, but I’ll save that for another post when I have perfected the process. Linked to Fiesta Friday #86. Categories: jams and jellies | Tags: apples, Fiesta Friday, foraging, goldenrod, jelly, seasonal | Permalink.